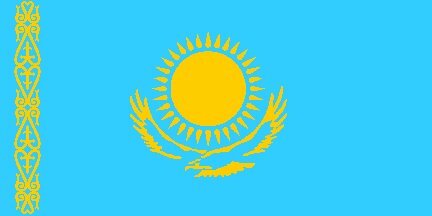 Our journey to Kazakhstan to bring our children home!! Well everyone, tomorrow is the BIG DAY! You all guessed right, my birthday. Ha Ha no really. It is our COURT DAY. We will be in front of the judge at 10:00 am and you guys will be sound asleep. Afterwards we will be partying with the care givers at the orphanage and then another party back at the hotel for all the new parents. Today we get just one visit being that it is Sunday. We are going shopping this afternoon for souvenirs. I want to get Nate and Alayna something from their birth country that they will always have. Yesterday we recorded a short video of the orphanage and the kids for all to see. Our days here are starting to fly by now. We have been able to pass the time with other families here in the hotel, but we still miss home. Some days we all feel like we're on "Survivor". We sit at the tables while eating our Ramen Soup and talk about how when we get home what we want our first meal to be. So far burgers are the top choice followed by a steak on the grill with baked potatoes. When we touch down in Memphis I will be heading for Starbucks, then on to this barbecue place we ate at on the way over here. Happy Birthday to you! You have the two best gifts ever this year. Prayers are with you for your court date. We are getting ready to go shopping and Alayna and Nate are on the top of my list. Sorry I am a day late, happy birthday, could not have two better gifts. You guys look greatm cant wait to hear all your stories and meet your beautiful children. Hey there girlfriend! Happy Happy Birthday to you! Can you believe all this yet? In pictures you are glowing as is Chandler... and what a difference in Alayna and Nate now that they know you! You are truly blessed this year with a present that will never be matched! You have two beautiful children now and you and Chandler will be starting a whole new chapter in your life as a family. I can not put into words how incredibly happy we are for you guys and the pictures only tell a 1/4 of the story the words maybe another 1/4 but the love in your hearts tells it all! God Bless you guys today and always. I miss you sooooo much and can't wait to hear all about it and to meet up in Virginia once you get them home. Tony's Bear Hug here we come! Love, Tracie et. al. FIRST OF ALL HAPPY BIRTHDAY ALYSON. HAPPY FORTHE BOTH OF YOU, CAN'T WAIT FOR YOU TO GET HOME. YOU ARE GOING TO HAVE TWO SPOILED CHILDREN. THERE IS SO MUCH LOVE HERE FOR ALL OF YOU. GLAD YOU FINALLY HAD YOU COURT DATE. SOON, AND ALL OF YOU AROUND JULY 7TH. Happy B-Day Alyson. The Court Day will go fine. Keep your heads and your spirits high, b/c the Lord will see you through the whole thing! Happy Birthday Alyson! Pray and hope everything goes well tomorrow in court! Happy Birthday Alyson!!! Best gift ever huh? Nothing like having your birthday and the children's Name Day the sameday. (thats what we call finalization day it's the day they get their new names) Natalie's birthday was yesterday she turned 4 just like Alayna. It won't be long now and you'll all be back home together. HAVE A WONDERFUL DAY. I KNOW YOU WILL FOLLOWING THE COURT DATE. CAN'T WAIT TO SEE ALL OF YOU TOGETHER AT HOME WITH PAIGE AND MORGAN. MANY BLESSING SENT TO YOU. HAVE A SAFE TRIP HOME. TAKE CARE. SEE YOU ALL SOON. Oh Happy Day (birth and court), never thought you would celebrate those events on the same day did Ya? Can't wait to see you and I am so glad all we hear is good news.